The local newspapers in the areas where they lived. And there’s no doubt at all that the news and society and personal and even sports pages of those local newspaper contain nuggets of gold for family research that we should never pass up. Births, marriages and deaths, at times. Personal notes of comings and goings. Even misdeeds reported when someone ended up in court. Make sure you read the legal notices, too. Because sometimes those legal advertising columns have even more that we’d like to know than the news columns do. It’s there that we’ll learn, for example, that an ancestor hadn’t paid his taxes on time, or that a relative was being sued for not paying his debts. It’s there that we’ll learn that the ancestor’s land was being auctioned off for non-payment of taxes or because he couldn’t pay his debts. And it’s there that we’ll find the notice about the foundling child, or the strayed horse. In those legal notices, there are stories unfolding about real people, real problems, real life. Let’s look at just one issue of one newspaper on one January day 250 years ago. The newspaper: The Pennsylvania Gazette, published in Philadelphia on Thursday, 15 January 1767. Turn to page 4 of the newspaper and feast your eyes on the goodies to be found in the middle of the three columns on that page. That’s as close to a birth announcement as you’re going to find in 1767 — and if your family is from Chester County and children in your family have a congenital birth defect involving their toes… well… you might want to take a look at those records. Sure nails Thomas Dungan’s feet to the ground in Bucks County, doesn’t it? Next steps, the land and tax records. The reward for the boy’s return was 40 shillings, so his master Hugh Newell really wanted him back. And if you’re descended from young John, you now have a lot more information about him than you’re likely to find anywhere else. You can’t help but wonder what the relationship was between Hugh Newell and James Newell … and if Hugh ever found out what became of the boy. • In the city of Philadelphia, a three story brick bank house that had been owned by George Fader alias Forten. • In the Northern Liberties of the city of Philadelphia, a two story brick residential building that had been owned by Adam Stock. • In the township of Northwales, in Philadelphia County, a residence and 12 acres of land that had been owned by Eleazer Williams. • In the Northern Liberties of the city of Philadelphia, a number of lots that had been owned by Jacob Stonemitz. In every case I might find a record in the deed books showing the acquisition of this land — but I’d need the court records suggested by these notices to be able to document what happened to the land in the end. 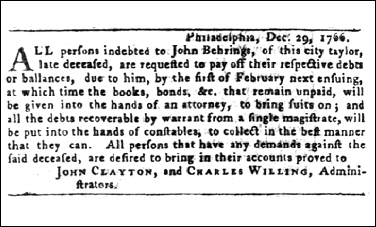 And then there’s the notice dated December 29, 1766, from John Clayton and Charles Willing, Administrators, telling everyone who owed money to John Behrings, deceased, of the city of Philadelphia, that they had to pay up by February 1 or face a lawsuit. Just one column in one newspaper published on one day in one city — and all those clues to all those stories. So when doing newspaper research, make sure you’re always checking the legal notices. You are so right, Kat — in cases where the courthouse burned, the legal notices may be the only records that survive. What does it mean that James Newell was”bred a Nailor?” Appears in today’s blog. The problem as we see it, the parents are still living. One son is suing all the other kids. It must have been OK with everyone because they all seem to visit back and forth after that. We haven’t found what happened to the court case. Track those court records! That’s where you should find the rest of the story. Where might someone find clues for a Great-Great-Great grandfather who’s has been only known even by my grandmother as Pete? You always start looking at the records of the person you know (your grandmother) and then gradually move backwards in time. The methodology isn’t hard — it just takes a lot of time and work. My Great-Great-Grandfather’s on both my mother and father side are Mystery Men!One of them is known by Pete (Peter)and the other one is nameless. My of grandparents were from the Rock Hill, South Carolina area but could not pass anything about them to their grandchildren! I can’t imagine the horrible conditions they were forced to live in? It hurts my heart to think about them! Without carefully, painstakingly, trying to find all the records, you don’t KNOW what conditions they faced — you’re just guessing. They may be as horrible as you fear, but whether they were or weren’t, working back to find everything you can about them and their times would be honoring their place in your family. Then, a few weeks later, one of those legal notices advising customers of the furniture business to make arrangements to retrieve their furniture from the address where the furniture business was located by contacting someone at the dead Henry’s home address. Court notices in the same newspaper later announced the filing of a will in favor of Henry’s widow (one of the two Janes) and the probate petition revealed that one of the other Henrys was the son of the store-owner. The junior Henry does not appear with the rest of the family in the 1850 census (the first to enumerate all members of the household by name) because by 1850 he was already grown up and out on his own. It was the notice to customers, by linking the addresses of Henry’s home and business without ever mentioning him by name, which was the crucial piece of evidence bringing all the pieces of this puzzle together. Good job of combining records to come up with your answer! Good site, yes, but for New Yorkers in general, the must-check site is Old Fulton Postcards. That man has singlehandedly digitized more newspapers than the Library of Congress. Regarding young Mr. Nailor: It is possible that the spelling is a variation of “Naylor”, which is the surname of a friend of mine. It is possible too that young James was the product of an earlier marriage of his mother’s, or even that he was adopted, or perhaps the son of a sister of one of the Newells. There is almost certainly some sort of family connection. All this of course is arrant speculation, all of which, Judy, you have most certainly considered. But it might give a line of enquiry to pursue in the Irish records, such as they are. A reader, Wendy, advises that the dictionary definition includes as one of the meanings of bred “to develop by training or education” and, she notes, there are lots of references on Google to “bred a sailor” for instance. My first thought upon reading “bred a Nailor” was that Nailor was his birth name, but that he had since been either adopted by or brought in and raised by Hugh Newell. Perhaps there would be a ship manifest somewhere showing him as a Nailor on the Rose from Belfast? Maybe adoption records? May or may not have been biologically related as well? I wonder also if his status as being missing was a factor at all in why John McCullough either ran away or was missing around the same time. That was my first thought as well, but reader Wendy suggests a different meaning (see the comment above in response to Stephen Low).